Text messages are still used by many professionals and businessmen across the world. The messages getting disappeared is common and can be frustrating if you are not able to get them back. There is nothing to worry if your text messages got disappeared or deleted suddenly, because you can recover them back to your iPhone. 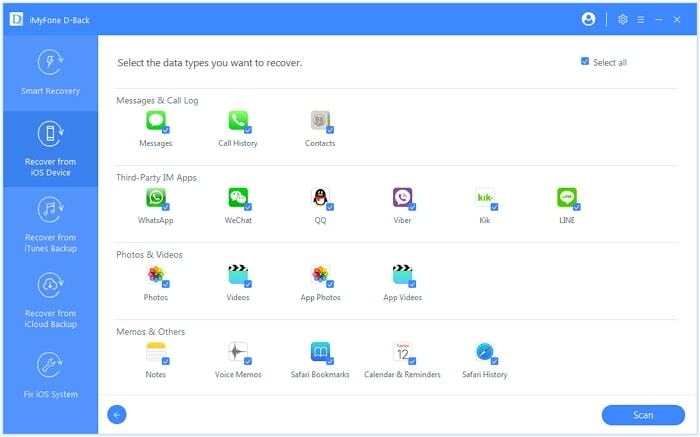 If you are one of the users, who are searching on the internet where did my text messages go iPhone, first you should learn the reasons for the messages data loss. A user posted on an internet forum that he lost the text messages after he updated his iPhone to iOS 12. After the messages disappeared, he was unable to retrieve them. The text messages can be lost due to formatting error or a virus attack. You can also lose the text messages after a restart or if the iPhone gets water-damaged. Accidental deletion is one of the other reasons for losing the text messages. Regardless of how the text messages were lost, you can always recover them using some simple methods. Phase 1. Where Did My Text Messages Go on iPhone? Phase 2. Can I Recover Deleted/Lost iPhone Text Messages? After losing the text messages, many users do not know where to find them and wonder where the lost text messages on iPhone are stored. The entire data in an iPhone is saved on the SQLite database. When the data is deleted specifically, the state changes from “Allocated” to “Unallocated”. However, the actual data remains there. 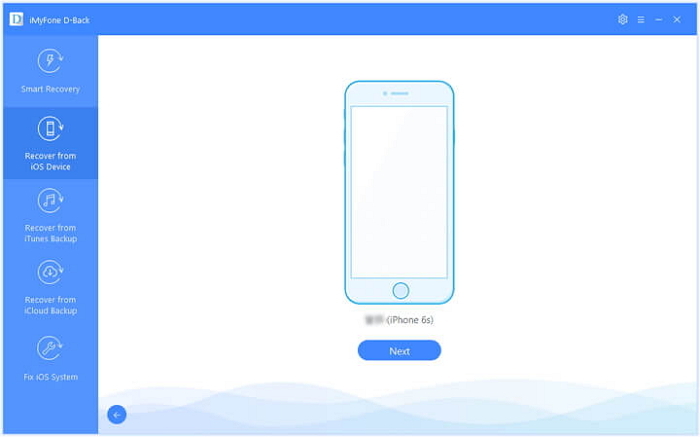 While using the iPhone, when you create new data in future, it will occupy the “Unallocated” space first, replacing the existing data. If you back up your iPhone, not only existing data will get backed up but also the deleted data of your device. But when restoring that backup to your iPhone, you cannot view or access the deleted data via iTunes and iCloud. You might lose your text messages because of various reasons but it is possible to recover the lost or deleted messages on iPhone. If you have made a backup of your iPhone, you can recover the deleted text messages by restoring the iTunes or iCloud backup. But, if you have not made any backup or there are no missing messages in the backup and still want to recover the lost or deleted sms of your iPhone, you need to immediately stop using the device. This is because new data will be created when you use your iPhone and replace the deleted data on your device. It will be then impossible to recover the data in future. 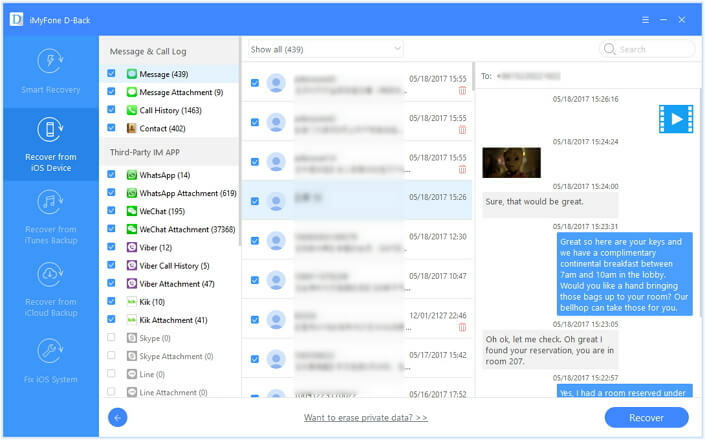 Then rely on specialized third-party software which use advanced technology to retrieve lost messages. They can access the SQLite database easily and recover the lost data. If you have not created a backup, you need to use professional and advanced third-party software like iMyFone D-Back, which is a professional data recovery tool. Due to the latest technology, the probability of data recovery is also higher. Compared to other software, the needed time in iMyFone D-Back is shorter. You can also safely recover the lost text messages on iPhone using any of the four modes within D-Back. D-Back applies advanced technology to search for the deleted text messages in the SQLite database in the most thorough way, which makes it the best text messages recovery tool with the highest recovery rate in the market. It supports to recover deleted text messages without backup. It supports to view the notes within iPhone backups which cannot be done with iTunes and iCloud, which means you will not restore a wrong backup with unneeded data. If you do not have any backups, you can choose this option. Step 1.Open iMyFone D-Back on your computer and select “Recover from iOS Device”. Click on “Start”. Connect your iPhone to the computer using the USB cable. Click “Next” when the software automatically detects your device. Step 2.Various file types will be displayed. Select “Message” under “Message & Call Log” and click “Scan”. Step 3.When the scan gets completed, all the existing and deleted messages will be displayed on the screen. Select the messages you need and click “Recover”. Official iTunes does not allow you to view its content, so you will not know whether it contains the notes you need until you perform the restore. This will make you choose the wrong backup to restore, so we suggest you try D-Back to view its content first. Step 1.Run D-Back on your computer and select “Recover from iTunes Backup”. Click on “Start”. All the iTunes backups will be shown on the computer. Choose the most relevant backup and click “Next”. Step 2.Select “Message” under “Message & Call Log” and click “Scan”. Step 3.When the scan gets completed, all messages will be displayed on the screen. Select the messages you need and click “Recover”. You will be asked to create a new folder or choose an existing one to save the recovered messages. Before restoring, you must erase your device which means you will lose all the data created between the moment your iPhone was last updated to iCloud and the moment you will restore your iDevice. Step 1.Launch iMyFone D-Back on computer and select “Recover from iCloud Backup”. Click on “Start”. Sign in to the iCloud account with your Apple ID and password. Step 2.All the iCloud backups will be displayed on screen. Choose the most relevant one and click “Next”. Step 3.Various file types will be displayed. Select “Message” under “Message & Call Log” and click “Scan”. Step 4.When the scan gets completed, all messages will be displayed. Select the messages you need and click “Recover”. The messages will be recovered successfully once you choose the folder. Here we will take brief look at the comparision of using D-Back and using official iTunes and iCloud. D-Back is trusted by professional websites and users in the world. Many users have already benefited by using iMyFone D-Back software. Here is one feedback of them. If you find the iPhone deleted messages by itself, view all the methods given above. See which method is suitable for your situation and choose accordingly. Let us know in the comments section below what you think about this topic. How Many Backups Does iCloud/iTunes Keep? How to View the Backup Files? Is There a Free iMyFone D-Back Serial Key? How to Increase iPhone Call Log History ? Does iCloud Backup Music? How to Access iCloud Backup?